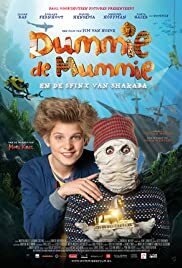 When Dummie, the little living mummy, realizes he will never grow up to become a real Pharaoh, he decides to become as famous as his father; the great Pharaoh, 4000 years ago. His best friend Gus and his dad are keen to help. Together they will think of something to make Dummie famous. When they hear of an ancient statuette that can make Dummie a human being again, Gus can finally stop worrying. If they can find this Sphinx of Shakaba before Dummie becomes famous, no one will ever find out he's a living mummy. Will Gus be able to find the Sphinx, which has been lost at sea for over 50 years and help his best friend?